Posture awareness practiced regularly during pregnancy can help reduce many physical discomforts. The female body, in a very short time frame, will undergo drastic changes in every bodily system. Our bodies have the incredible capability of adapting to these changes while continuing to run efficiently. While no two pregnancies are identical, most women’s bodies will respond to these changes at some point with aches or pains…To say the least! Though sometimes it feels like all we can do is hang on for the ride, there are actually a number of ways to bypass some of the physical discomforts that so many women experience today. We may not have the ability to prevent our digestive tract from being squished during pregnancy, but we can choose how much gravity affects our posture, and in turn, the way we feel. We’ve all seen the curves on a pregnant woman—whether on ourselves or on others—and it is obvious that most women, in their last stage of pregnancy will look and possibly feel like a balloon ready to pop. Some balloons, however, rise as they expand. We too can rise in our posture with the use of awareness and energy. The key is to think of lengthening upwards. If we can understand the difference between good and poor postural habits, we can then train the body to hold itself up the way it was designed. In reality, it is never too early to begin using these postural tips; even if you aren’t quite expecting yet. You don’t have to wait until your third trimester to begin applying these. In fact, it may be more challenging to maintain new adjustments if you wait until then. However, it is never too late to begin either. In some situations, these tips helped me achieve instant pain relief during my own pregnancy. Some good general advice for this article is to take it slowly. Try focusing on one aspect of your posture a day and adding a new tip when you’re ready; possibly each week or month. Don’t expect yourself to take on all 5 tips at once. If you did you’d probably end up walking around like a robot, and relaxation is essential for maintaining proper posture, especially after you’ve made an adjustment. Don’t expect instant results. Any postural changes take time to adjust to, just like taking on any new habit. The body and brain need about 30 days of repetitive practice to accept new concepts. The good news is that the brain is capable of creating new grooves. If poor posture has been practiced for decades, it can be still be transformed. For those who really put their energy to a complete focus, they can make changes instantly. Stand sideways in front of a tall mirror and take a look at your alignment. Notice any significant changes from your ordinary posture; i.e., larger belly and/or breasts. The following exercise may help you find a solid foundation for supporting your new curves. First look at your base: check that your feet are below you, hip-width apart and toes pointing forward. (You can check the approximate hip distance apart by placing two fists, knuckles forward, next to each other and in between your feet.) It’s common in pregnancy to stand with a wider and wider stance as your belly grows. This is natural, but keeping the toes pointing forward helps support your pelvis and spine most effectively. Working on your foundation is the best place to start, and then you can work your way up from there. 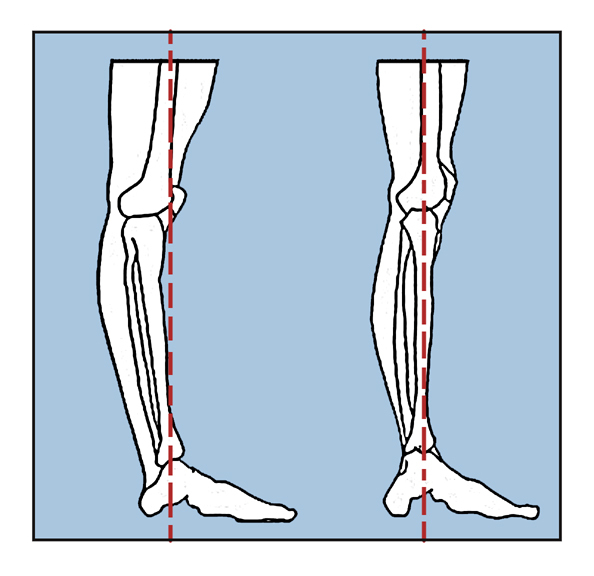 Check that your knees are soft and springy rather than locked in place. I’ve found it very helpful to actually bend my knees slightly to get the feel for soft knees. Locking the knees is a poor postural habit practiced by many, and can be overly emphasized during pregnancy. When the weight of the abdomen grows rapidly in front, it becomes easier to push the knee caps backwards to compensate for the weight. 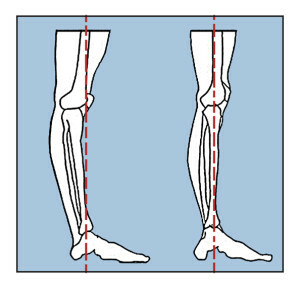 Hyper-extending or locking the knee joints not only cuts off circulation and adds excess tension in our legs, it also encourages swayback and prevents proper leg support needed for good posture. Fortunately, there are many opportunities throughout the day to practice correcting this tendency. Try softening or bending your knees while standing, talking to friends, making food, taking a shower, brushing your teeth, or checking yourself out in the mirror. The following tip helped me throughout my pregnancy to support my back, lift my abdomen, and avoid backache. Look at your pelvis from the side. You can place your hands on your pelvic rim just below your waist and align your pelvis above your knees. Now does the top of your pelvis look level with the floor or is it tilting slightly forward? Many women stand with an exaggerated curve in their lower backs for different reasons, and pregnancy can exaggerate that curve. If you have a large baby bump it’s likely that the weight is beginning to tilt your pelvis forward (or in other words, lift your tail bone up behind you). If standing with your belly out, buttocks out, and lower back deeply curved is the way you’ve always stood, now is a very good time to change that! You’re likely to experience some back complaints during your pregnancy if you always walk with your abdomen hanging out. To improve swayback lengthen your tailbone towards the floor. Think of relaxing or tucking your imaginary tail (attached at the base of your spine) down in between your legs until your pelvis become level with the floor. Notice how that lengthens your lower back. You may also notice that your knees naturally wanted to soften when you dropped the tailbone down. This is good. Every improvement in posture can be supported by surrounding body parts. For example, to help you maintain this lengthened lower back, try engaging your lower abdominals and buttocks to lift and support your tummy. Think of drawing your belly button towards your spine. Keep your belly soft even while pulling the lower abs in. We don’t want to constrict our breathing while making this adjustment. As your beautiful baby develops in the womb and your uterus continues to grow in size, gravity can pull the front forward, and with it, the shoulders too. Your upper back may be tempted to round forward with your shoulders causing a collapsed chest. This postural defect restricts deep breathing, adds pressure to the rib cage, and causes indigestion. If you were to draw a line from your outer shoulder down through your waist you’d want your hips to be directly below your shoulders. A good way to align the upper body over the pelvis is to gently lift the breastbone and lengthen through the top of the head. Adjust yourself as needed to find this alignment and then relax into it. Relax your shoulder blades back and down, and arms at your sides. Take a deep breath from your lower abdomen up to your chest, and then exhale in reverse. This should allow you to breathe more fully, sending more oxygen to your baby. Have you been staring down at your belly lately? Are you beginning to lose sight of your feet? The action of bringing your head forward while dropping your chin takes your neck out of accurate alignment and can cause a neck ache. This tendency may be difficult to correct after pregnancy as well. Once you have your baby in your arms, you’ll be looking down at her a lot. After you do, try to remember to bring your head upright again by gliding your chin back towards the base of your skull. Think of aligning your ears over your shoulders. We also want the chin to be level with the floor and the head neither in front nor behind the torso. Finally, RELAX! Good posture doesn’t mean standing like a soldier. Relaxation is most important for you and your baby. Breathe into your new and beautiful posture. Each month of pregnancy brings in a new set of changes for the body, so don’t forget to keep checking in. These tips may become even more handy postpartum. I had my baby 3 months ago and I’m continuing to work on my posture every day. Thank-you for reading this article. I hope you found it helpful. Congratulations on your pregnancy and blessing to you and your baby for a healthy, happy, and beautiful birth experience! This entry was posted in Yoga Therapist Training and tagged postural tips, pregnancy, pregnancy postural tips, prenatal yoga, yoga. Bookmark the permalink. Thank you for the sharing exercising tips, explained very well, will recommend your blog to my patients so they can easily do this at their home as it seems safe exercise to try.